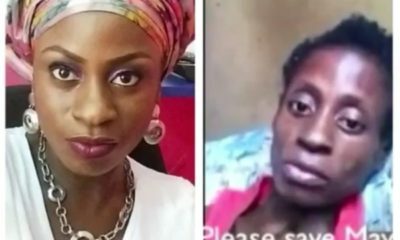 The family of Mayowa Ahmed, last Friday released an update on the #SaveMayowa campaign. Last Friday, Mayowa’s brother, in a series of Tweets on his handle @Asiwaju_Foye thanked everyone that has supported the campaign, adding that Mayowa is set to travel to the UAE for treatment. On behalf of Mayowa Ahmed, the entire Ahmed family say a big thank you to well-wishers for your contributions towards the fundraiser to #SaveMayowa. We are totally grateful to EVERYONE for their donations, support & prayers. We pray that Allah reward you all abundantly. Mayowa remains our primary focus and concern; currently being prepared and monitored for her long awaited treatment abroad. We are working earnestly to ensure she makes the trip in best health status for the doctors to continue and complete d process abroad. We have engaged a hospital in UAE where a doctor has accepted to treat her for the ailments as identified by doctors in Nigeria. They had advised on a date for her to arrive in their facility and we made necessary arrangements to ensure we meet up. 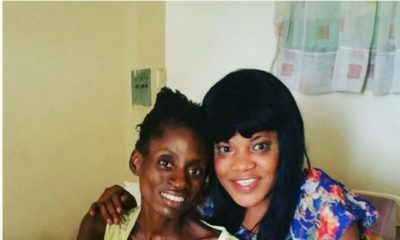 In our quest to move Mayowa abroad for treatment, we went through several challenges. From securing a 3months visa to UAE, getting an emergency doctor to accompany her on the trip (as requested by the airlines), and ensuring her discharge from LUTH was not against the ongoing investigation of the scam accusation by the police. All contacts that we were working with at the initial stage abandoned us as we were accused of scamming Nigerians. Why will anyone sit down behind their laptop and accuse an entire family of scamming nigerians without even visiting the hospital?. Due to the setback we could not meet the initial date advised by the hospital in UAE. We were rescheduled for a later date. With the help of friends and well-meaning Nigerians (home and abroad), she is set to travel for her treatment. Mayowa has gone through unimaginable emotional roller coaster since the beginning of the #SaveMayowa campaign. Mayowa on her sickbed has watched all videos on #SaveMayowa,read virtually all articles written – the lies and unconfirmed “exclusives”. From high enthusiasm of funds raised, to a low point of being accused as scam to rip humanity of d gift of hope given to her. Mayowa’s desire to live has kept all of us firm and committed to her full recovery. She’s the strongest woman I know. We’ve had our own dose of being looked at differently due to someone’s false claim of calling #SaveMayowa a “SCAM”. Our lives are no longer what it used to be. Our jobs, means of survival and future treatment of Mayowa was put in jeopardy. We but have to keep striving on and praying for God’s favor to give Mayowa the life she yearns for – healthy and happy. We have a goal and that goal is to get Mayowa better, healthy and back on her two feet to thank God for His mercies. Mayowa will come on here to thank you to all that have helped in her recovery God’s willing. As a family, we would like to thank God for giving us this opportunity to say thank you and for preserving our dear Mayowa’ s life. 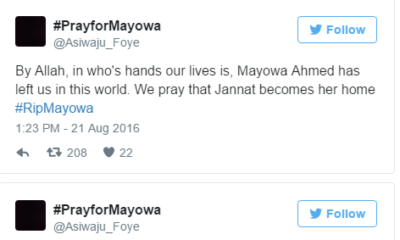 We appeal to everyone to continue with their prayers so that Mayowa would live to give a testimony of this ordeal. Maybe cheap potshots, but you can never and ever will imagine the gravity of mischief the scam tales have caused th family. I personally have a predilection for the lady who broke the exclusive news (inspite of her hermes meltdown and all what not cause we’re all humans hence flawed), but honestly took her blog off my bookmark after that. I used to visit her blog everyday, but have only once since the incident to see if she’d offer an apology to these family for peddling falsehood or half truth. Apparently she hasn’t. You don’t know the tears thi family has cried. You don’t know their misery. The anonymousity of your opinion doesn’t devoid you of compassion and reasoning. I have never lost anyone, never had my loved one lying on a bed confined to death but I know what hoping against hope means. This family needs support and nothing else. May GOD heal Mayawo, and may peace be unto her family. I am so with you on this one. I feel so bad for the family and I continue to pray that Mayowa survives this ordeal and is able to get the proper care and treatment that she and her family have fought so hard to get. I lost the little respect for the lady blogger that broke the unverified news that it was a scam. It was very little respect and I have not been back on her blog since then. I refuse to support someone who places the need to sensationalize news over precious human life. Finding out now from you that she has not even offered an apology for her role in the confusion is something I find completely despicable. Did u say cheap potshots?when someone sits on a computer and assumes you and ur entaya family are scammers,Pls sit down there and just smile and look and not fight with every available word u can mutter. Whatever happened between the family, Toyin aimakhu/aramide and linda ikeji is already water under the bridge. They can write from now till tomorrow and nothing will change. So they can choose to either continue debating who said what and why or they can focus on Mayowa. Please, in your frustration don’t insult a whole family like that. It’s unfair to call them rubbish and useless. Let’s learn to communication without being so aggressive. I totally agree. There was no need for all the scam comments, Take it or leave it the duo of Aramide and Toyin played a part in all the fundraising. So please show some gratitude. so she’s still in Nigeria? oga o! They are still ‘engaging hospitals’? hmmm!! delay could be dangerous o. Don’t test God. Did you read that she couldn’t fly in her condition and they had to stabilize her. Some of you really have no sense. i’m sorry but i thought mayowa was meant to go to america for treatment, how come her destination has changed to the UAE. Plus with 122 million naira is dubai really her best option? She can’t go to the US yet for a multitude of reasons. First of all,she is not strong enough to embark on a long trip to the US, given the flight time from Nigeria to the US is almost twice as long as the flight to the UAE. Secondly, she’s having issues getting a visa to the US and now she’s going to the place that has relatively less difficulty in offering visas. Both places have excellent healthcare systems so she’s still going to be receiving treatment. 122 million is also not a lot of money to get treated in the USA. The US hospital quoted the costs per treatment as I guess they can’t know for sure till she is there and treatment finished. It could easily get up to $500k. If they come back and ask you guys to donate some more – will you? I listened to Toyin’s interview on Inspiration FM, and well even she had a big issue confirming if it was a scam, That’s when she wasn’t crying or forming pity party. I just pray Mayowa makes it and lives to glorify God for her good health. Oga, you did not have to tell all that story again. Remember, those ladies helped you in the time of need. You rode on their backs. Whatever happened was a misunderstanding which they have a right to… and further apologized. As I see this case, blame the enemies and not the ladies (This is a spiritual warfare). Move on already and don’t forget your source. Stop appealing to people’s emotions please. May God’s healing hand be upon your sister, and may she come back safely in Jesus name. They have to say the story please…find your humanity Nigerians!!! !thank God your family has never been wrongfully accused before. So what if they helped her, were they the ones that created her. What if God did you favours and then teba ti favour na..
All their focus and energy right now should be on getting Mayowa to Dubai for her treatment urgently, and the accusations and recriminations can be dealt with later. She truly is a strong woman, I pray God sees her through. But I can also imagine their feelings knowing that they could have taken her abroad if the scam allegations hadn’t been made. Hopefully everyone involved has learnt from the whole debacle. I pray it all ends in praise to God and healing for Mayowa. They could not have taken her abroad, because they had not arranged for any documentation, never got any approval for any foreign hospital…They asked for help, but had not yet done their homework properly. It was not right of them to exclude Toyin when she was the one who motivated the majority of people into giving them money. Mayowa’s brother is very arrogant. Their actions were doubtful and raised questions about their integrity. He should not shout at anybody, but act fast for his sister. How can you tell us that Mayowa is aware of everything that has been said about her family. Any news of this kind could send her to an early grave. Could you not have kept her away from social media? This brother of hers gets on my nerves. I pray that God save the life of Mayowa. I pray that she makes it to UAE and return home safely. I refuse to read. They should go and threat her. But they should not forget “never bite the hand that feeds you”. I wish the sick lady a miraculous recovery. forgive my asking but the family didnt state the date when she will leave or even a time frame. the more she stays in nigeria after being discharged from luth isnt goo. like the said Mayowa is the focus please they should hasten up as i also know that emergencies abroad are treated as top urgent cos they value life more than us. They abandoned you after you guys were chasing people away. If you didn’t want them to abandone you why did you have to chase them away and said you didn’t need them anymore after the money was raised. All am praying is for her recovery, I actually don’t care about the brother because he is rude.